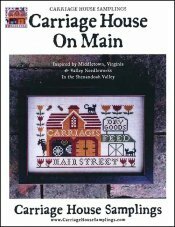 Carriage House On Main Carriage House Samplings Carriage House on Main - Cross Stitch Pattern [C6059] - $9.00 : Yarn Tree, Your wholesale source for cross stitch supplies. Cross stitch pattern by Carriage House Samplings. A building on main street with carriages, dry goods, and feed. Flowers, cats, and bees accent the design that was inspired by Middletown, VA. Stitch count 108 wide x 70 high.